After writing that recent article about Endeavor and the economics of slavery, I have been itching to write about more board games. For the past four months or so, I have been frequenting a board game club where I gather around a table with strangers and play a variety of board games. Some of these involve the cutting and distribution of pies while others involved the strategic proliferation of stone-age homo-sapiens. Every week I come home with a renewed appreciation for clever game design. 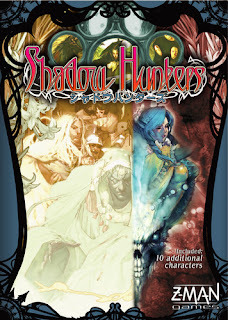 While our gaming group plays an assortment of titles, we often come back to several games time and again, the most frequent of which is Shadow Hunters. Like some of my favorite board games, Shadow Hunters has a secrecy mechanic and is pseudo-cooperative. Depending on the number of players, an assortment of identity cards are distributed to each player. Each identity belongs to a particular faction: Shadows, Hunters, and Neutrals. For the most part Hunters is a team game, but I find its variable win conditions its most interesting and well executed feature. As a player, your win condition entirely depends on your identity and associated faction. Hunters will always win if they kill all the Shadows. Shadows will always win if they kill all the hunters or, with enough players, if they kill all the Neutrals. Neutral players add the real flare, each coming with their own win condition. Allie, for example, satisfies her win condition if she is alive when the game ends, and therefore wants to speed things along as much as possible without making herself a target for aggression. In Allie's case, she can share a victory with other players. Similarly, another character claims victory when the person sitting to her immediate right wins the game. If this character reveals her identity, she can switch her allegiance to the left on her turn. Other Neutrals have more selfish desires. Charles wins the game when he gets a kill after two or more characters are already deceased. Daniel, on the other hand, wants to be the first to die. Both of these characters take the solitary win, leaving all other players out in the cold. Of course Daniel and Charles might not be in the game at all, making the pursuit of information that much more important. Hermit Spell cards help players discover learn information about the identity of others, but rarely is this information completely clear. A Hermit card might say "I bet you're a Neutral or a Shadow. If so, you receive one damage." If you are playing a Shadow, and the person says the card does not apply to them, then maybe you have found your target. Or maybe they are the Unknown, the one Shadow character permitted to lie. If they do receive one damage, they could be an ally, or a Neutral biding their time for the right moment to strike. As you can imagine, playing the game becomes as much about information gathering as reading player behavior. Is that play Daniel, being a little too aggressive in hopes of making enemies? Or is that a Shadow, taking your inaction as an opportunity to strike? Variable win conditions change gameplay for an individual, but they also change the entire game every match. With many ways to win, comes dynamic ways to play.